This wallpaper was made by my dear friend, Aero.Thank you for this lovely gift, Aero. J'adore ces 5 cœurs qui s'envolent comme des papillons... La lumière sur ce chaton est tout simplement magique ! 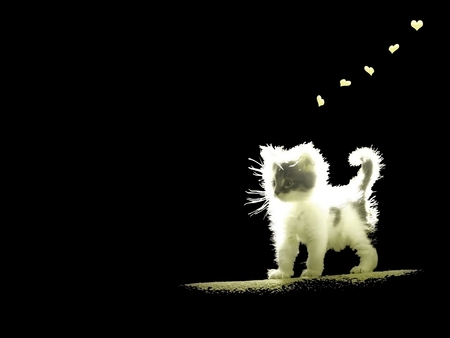 a sweet kitten in the light and the light in the black ! +++ J'adore ! "The smallest cat is a masterpiece,"
quote Leonardo Da Vinci Italian Artist. Adorable...... Really a sweetheart kitty ! The light is just awesome ! Black and a wonderful white kitten... Stunning ! I love his whiskers so much.